Saturday December 15th 1877 I baked cake in the morning and helped with the work till the middle of the afternoon Mollie Stevens was here for dinner. After supper we girls went to town and spent the evening with Win. I paid $5.00 on what I was owing at the Panic store, a pleasant evening. Sunday December 16th 1877. I went to church in the morning. When I came home I helped get the dinner over and practiced a couple of hours. Mother and Lee went to the valley to stay a few days. I wrote a long letter to Owen in the evening and practiced an hour. 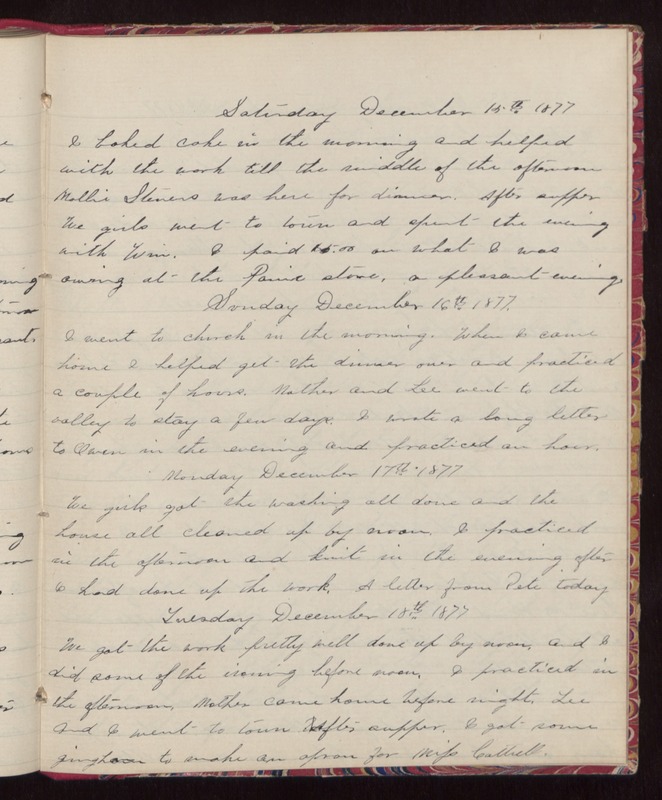 Monday December 17th 1877 We girls got the washing all done and the house all cleaned up by noon. I practiced in the afternoon and knit in the evening after I had done up the work. A letter from Pete today. Tuesday December 18th 1877 We got the work pretty well done up by noon, and I did some of the ironing before noon. I practiced in the afternoon. Mother came home before night. Lee and I went to town after supper. I got some gingham to make an apron for Miss Cattrell.